Ronnie James Dio was, perhaps, one of the most influential singers in all of heavy metal. Some have said he created the “Devil Horn” sign. Some say that, between him and Rob Halford, we were witness to some of the best vocal work one could ever hear in metal. Up until his passing in 2010, one thing was for certain: his influence has been felt through the generations of metal bands and the fans who cheer them on. 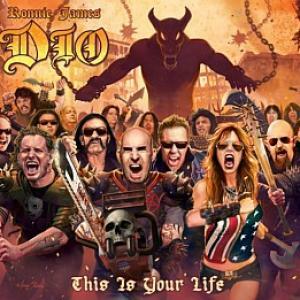 On this tribute album, This is Your Life, we get to hear the bands that he both influenced and befriended with cover the songs that made Dio an icon. All the big players are here: Anthrax, Rob Halford, Killswitch Engage, Scorpions and even Tenacious D. There is a supergroup of folks doing “Rainbow in the Dark.” They all take Dio’s tunes and create their own versions while staying true to the original sensibility that made those songs incredible in the first place. Anthrax kicks off the album with “Neon Knights.” It’s a rager. The vocal is almost identical. Joey Belladonna delivers the best impression of Dio one could possibly do. Scott Ian lays down the riffs with constant chugging of a train. Tenacious D’s cover of “The Last in Line” is just as incredible. Jack Black nails the vocal as best as he can. Don’t let the acoustic intro fool you– when they go full electric the groove of the song takes the reigns. Even the flute solo is awesome. “Rainbow in the Dark” is the biggest hit on the album. Corey Taylor (Slipknot/Stone Sour) leads the group, which is filled out by Ray Moraga on drums (also of Stone Sour) and Russ Parrish (Steel Panther) on guitar. The track is a straight take of the original masterpiece. The solo is insane and almost absurd in its delivery. Corey Taylor proves once again why many have said that he has one of the best voices in hard rock today. His delivery of “Holy Diver,” while not as operatic as Dio’s, is right on point with the track, giving it a modern feel. If you like Dio you will enjoy This is Your Life. If you are a fan of the bands on this release you won’t be disappointed with their take on these metal classics. The one thing that everyone will take away from this tribute, whether a Dio diehard or not, is the undeniable fact that even in death, he is revered. This album proves, once again, that the great ones never truly leave us.